Cholesterol - a natural lipophilic alcohol, contained in the cell membranes of almost all living organisms. This component is important for the functioning of the body, performing certain functions. For example, Cholesterol has been actively involved in the development of steroid hormones by the adrenal glands: estrogen, testosterone, cortisol and other. Cholesterol is considered to be a reliable protection for the red blood cells, which are affected by hemolytic agents. In this way, the importance of cholesterol is not only in the synthesis of hormones. More 80% important functions is produced by the body. The remainder is accounted for by products, reduce or increase this substance in the blood. It is synthesized in the kidney, liver, intestine and adrenal gland. For cholesterol lowering apply high and low density lipoproteins. The first type is considered "good", the second - a "bad". The negative side of the latter species is due to low solubility of these components, that affects the stability of allocation of special crystals. The latter in turn form atherosclerotic plaques in blood vessels. It promotes the development of atherosclerosis. When, when the level of bad component above the norm, if possible heart attack or heart disease of different systems. How to lower cholesterol is determined by the physician in each case on an individual basis. At the same time doctors based on the results of laboratory tests. Initially, the patient gives blood for analysis. Anyway, There are a number of generally accepted indicators. For example, LPNP. Its level should not exceed 100 mg / dL. often up 130 mg / dL. doctors believe norm. The patient card is inserted in this amendment. When a substantial increase, within 150-160 mg / dL, Cholesterol is required to reduce 130 mg / dL. Drug intervention is allowed in the case, if this figure is 190 mg / dL. With regard to the rules of HDL, this indicator is measured as a percentage or numerical value. In the second case the level shall not be less than 1/5 of the total cholesterol level. It should be noted, that when applying for medical assistance as a result of some discomfort, doctors prescribe medication to lower cholesterol is only through 2-3 of the month. Prior to this period, physicians use no medication. Not medical method of lowering cholesterol is to avoid the patient from harmful habits - smoking, abuse of liquor. During this period, you need to lose weight. Comprehensive treatment will effectively solve the problem, how to lower cholesterol. To do this, the patient must clearly keep track of your daily diet, actively engaged in sport and recreation. The important point in this issue is a walk in the fresh air. Doctors do not recommend the immediate use special preparations. The patient must learn to be your diet properly. By reducing cholesterol in the blood is necessary to avoid stagnation of bile. This fact depends on the mode and power. An important condition is to monitor, and the immune system. Actively watch for any viral disease. In any case, it is not recommended to abuse drugs and to self-medicate in the presence of endocrine diseases, types of diabetes. Otherwise, diet, aimed at lowering cholesterol does not help. Reduce blood cholesterol and may for chronic kidney and liver. In this case, you should not drink Supplements. You can use vitamins E and C, and calcium, niacin and activated carbon. must be considered, that each of the above products has its own mechanism of action, therefore, they are assigned based on individual order. Anyway, detect high levels of cholesterol in the blood is difficult. Vascular pathology often occurs without symptoms. This leads to a sad outcome. Before use of any other drugs, it is recommended to consult a doctor. Elevated blood cholesterol is considered a major risk factor for these diseases, as atherosclerosis, angina, coronary heart disease, heart attack, peripheral arterial disease. according to statistics,, annually such diseases are the leading cause of death, and they accounted for 60% . This indicator is considered normal, if it is below 5 mmol / l. The slight increase to 5,2-6,7 mmol / l. If the index ranges 6,7-7,8 mmol / l, then the blood is too much cholesterol. For severe hypercholesterolemia, characterized by the following figures - more 7,8 mmol / l. People, who have had a stroke or heart attack, or they suffer from angina, diabetes, peripheral arteritis, then the total cholesterol level should not exceed 4,5 mmol / l, and the level of "bad" cholesterol - LDL - less 2,0 mmol / l.
Normalization of blood cholesterol reduces the risk of cardiovascular diseases, increasing the human lifespan. Reduce the level of the lower index 4 mmol / l is possible with the help of special preparations, for example, fibratov and statin. Many German researchers believe, that these means the opposite effect. With their use, many patients die from cardiovascular disease. In the same time, these drugs are necessary when abnormally high levels of blood cholesterol. However, statins may reduce the biosynthesis of this important antioxidant, as a coenzyme Q10. Question, associated with the, how to lower cholesterol, It includes drawing the correct daily menu. Doctors recommend to reduce the figure to 10-20% for 4-6 weeks, eating healthy food. Gently have recommended products, which reduce cholesterol levels. Otherwise disrupted cell membrane stability. Active component responsible for the normal and the production of vitamin B, taking an active role in the normal functioning of immunity. From the patient's diet to exclude foods with high cholesterol. The day allowed to eat about 300 mg cholesterol. The greatest amount of this component is in offal: kidney - 1140 mg, liver - 450 mg, brains - 800-2300 mg.
to remember, that is cholesterol only in animal products, and what they are fatter, the more their cholesterol. Concerning, it is recommended to consume a minimal amount of fatty meats, especially pork and lamb, birds, offal, eggs, sour cream, cream, fat cheese types. Since wieners, hot dogs and sausages are made with the addition of these by-products, so there is much less cholesterol, than, for example, in meat. Regarding the choice of dairy products, then the best option is a product with a low percentage of fat. The important point in this issue is to limit the consumption of sugar. This product is also able to increase blood cholesterol. More dangerous to human health is considered to be a hidden sugar, part of the confectionery, ice cream, carbonated water. 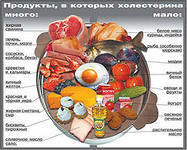 Completely excluded from the diet is necessary to sauces, mayonnaise, pickles, fat river fish, kopchёnosti, instant soups. Coffee lovers need to drink this drink only two cups a day. Conducted in the US studies have shown, that between the use of natural coffee and increase in cholesterol levels in the blood have a certain relationship. Replace fatty foods can be other food. So, for example, instead of fatty meats can be bought meatless products. In the presence of fat in the meat, it is required to cut. It should be remembered, that the skin is much cholesterol. Periodically, it is recommended to replace meat with soy meal, rich in vegetable protein and lecithin. At least 1-2 once a week you need to eat all day long fish. For example, Lunch will be enough to eat 200-300 Mr. fish. As known, This product is a protein, and cholesterol in it 2-3 times less than, than meat dishes. Also there is acid in fish, reduce cholesterol in the blood. Be sure to include in the diet of nuts: MYOB, almond, fistashki, cashews and other. Their function is to normalize metabolism, giving the walls of blood vessels elasticity. Cholesterol in this case may not settle on them, forming plaques. Dairy products are essential. Therefore it is recommended to give the preference to those products, which contain a minimal amount of fat or fat-free, they. Diet, which is aimed at lowering cholesterol, It should consist of cereals, vegetables and fruits. As they are free of cholesterol, but there are a lot of fiber, vitamins E, S and A, as well as antioxidants, which makes the walls of vessels elastic and healthy. It is impossible to solve the problem, associated with the, how to lower cholesterol without the inclusion in the diet of cereals and legumes. These components contain the same amount of fiber, how and vegetables. they are also rich in protein, which is easy to digest, including slow carbohydrates and substance, have a positive effect on the vascular wall. Some studies have shown, be an effective tool in the fight against cholesterol is broccoli. This is due to its constituent substance sulforaphane. Broccoli is well protected vessels from sugar. 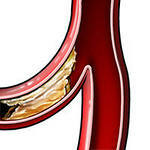 The final component of the body destroys, promoting the formation of blood vessels in the corrosion process. On damaged areas formed atherosclerotic plaques. When giperholesterinimii initially recommended to normalize exchange process substance, including lipids. For this purpose, the power required to include vegetables. It is better to eat boiled, stewed and steamed dishes. when frying, food absorbs about 50% fat, which prepares. Be sure to include foods diet, which are rich in unsaturated fatty acids. These include seafood - crabs, mussels, oily sea fish, seaweed, vegetable oil - soybean, sunflower, linseed, fish fat. Will benefit pasta, potato, sour. These products contain a lot of starch, carbohydrates, thereby increasing the body's level of serotonin - a substance, which calms the nervous system, lifting man mood. Starch, Unlike sugar, It does not increase blood cholesterol levels. US studies have proven, that effectively reduce blood cholesterol levels and fresh cherries or cherry juice. Swedish scientists have proved, fatty slaves that has a similar effect on cholesterol, and that the cherry. This experiment was the following. Several hundred participants ate at 5 about once a week 150 grams of fried herring. At the expiration of 7 days carried out a detailed survey of physicians. it showed, that the fish sates blood "good" cholesterol. Its function is to protect the human body against atherosclerosis and various diseases of the cardiovascular system. It should be noted, that the study did not use salt, and fried fish. Anyway, after meals is recommended to drink one cup of green tea. This drink has long been considered an excellent tool, which purifies the blood, giving the vessel walls more elastic and soft appearance. Composed menu should include only useful and necessary for the body products. Solve the problem of, how to lower cholesterol, Physical activity can help. Unable to dieting, do not change your lifestyle. It is recommended to go in for sports, doing squats, different exercises. maybe, that its duration will be 30 minutes. The main exercise regularly - 3-5 once a week. must be considered, that physical inactivity increases the risk of developing cardiovascular diseases. Moderate exercise also contribute to the increase in the blood level of man "extra" cholesterol.